If you’ve driven through Willow Grove lately, you might have noticed some major construction going on. 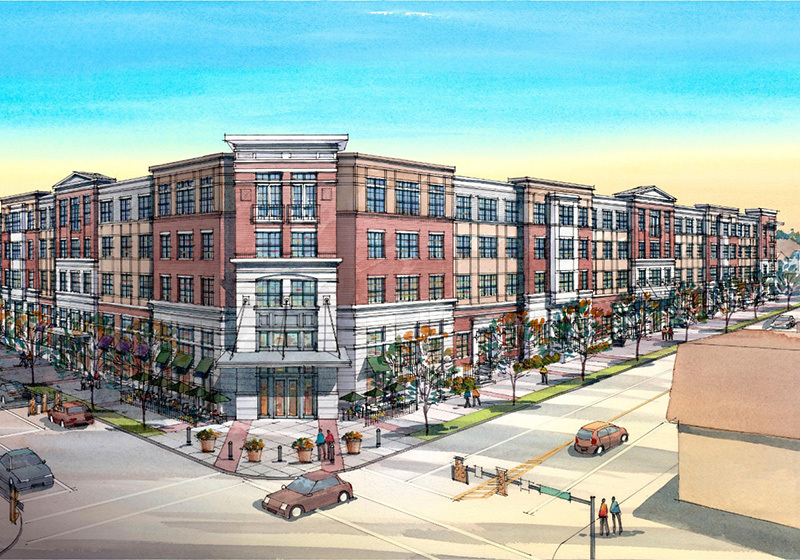 Turns out, the district is about to make a major about-face on suburban sprawl and welcome walkability. The area that has served as the poster child for soul-crushing auto-based development for the past 40 years looks like it could finally enter a period of renaissance. …five-story mixed-use development will have 275 upscale apartment units and 25,000 SF of commercial space, including retail on the ground floor and an 18,000 SF medical office. Outside there will be two landscaped courtyards, a resort-style pool, and a dog park. And Jenkintown gets a Taco Bell. For those of us here in Jenkintown convinced that a Taco Bell will “save” the school district, this development could probably accommodate a half-dozen fast-food joints complete with drive-through windows. Apparently, someone crunched the numbers and saw that more money can be made with pedestrian-friendly, mixed use. It’s entirely possible that the developers might have overreached with this project, and indeed one the major downsides of this concept is the high rents of the retail space targeted to national chains at the expense of local business. However, this is a major step in the right direction, which could now transform Willow Grove into a real transit village and a destination for residents and visitors alike.